Welcome to Cleanwatch. Each issue offers the latest news, events, and other resources on clean energy, transportation, water, and materials. 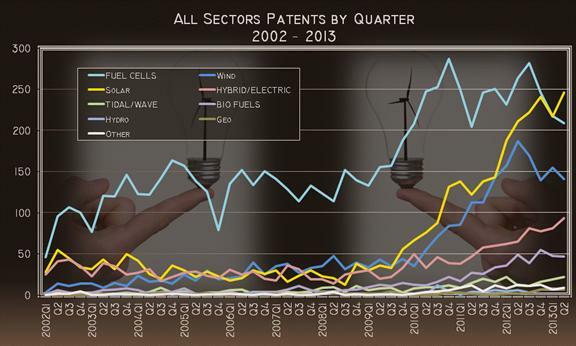 Patents granted in the clean energy sector ticked up to 765 during the second quarter of 2013, according to the latest Clean Energy Patent Growth Index from Heslin Rothenberg Farley & Mesiti P.C. Solar patents topped Fuel Cell patents for the first time, jumping 29 to 246 relative to the first quarter. Clean Edge’s U.S. Clean Tech Leadership Index uses patent data from HRFM. Click here to learn more about HRFM’s Cleantech Group. 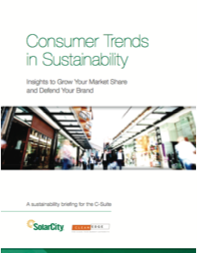 In partnership with Clean Edge, SolarCity has just released a new briefing report for the C-Suite: Consumer Trends in Sustainability: Insights to Grow Your Market Share and Defend Your Brand. In the review of recent green consumer data and trends, the briefing provides market insights, highlights barriers for corporations, and illuminates the opportunity ahead. SolarCity and Clean Edge will release new research on clean-energy consumers in the coming months. Stay tuned! Mark Udall (D-Colorado), Tom Udall (D-New Mexico), and Ed Markey (D-Mass.) 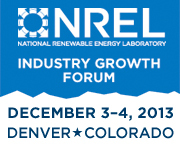 have all called for a national RES policy, proposing a short-term six percent requirement of renewables adoption (2015 for the Udall bill, 2014 for Markey), gradually increasing to 25 percent by 2025. Cities and states across the U.S. have issued over $43 million to more than 180 commercial property-assessed clean energy (PACE) financed projects, according to data from PACENow. In an energy-saving effort, the city plans to replace all of its 250,000 streetlights with brighter, whiter, energy-saving, light-emitting diode fixtures in one of the nation’s largest retrofitting projects. GSA recommended the Green Building Initiative’s Green Globes 2010 and the U.S. Green Building Council’s Leadership in Energy and Environmental Design (LEED) 2009 as the third party certification systems that the federal government can use to gauge performance in its construction and renovation projects. The Center for American Progress has released an analysis of solar installation data from Arizona, California, and New Jersey that found that solar installations are overwhelmingly occurring in middle-class neighborhoods. KiOR, Inc. has announced the execution of $100 million in committed equity related financing in two separate private placement transactions to support the Company’s recently announced expansion of production capacity in Columbus, Mississippi, called the Columbus II Project. Global investment in clean energy was $45.9 billion in the third quarter of 2013, down 14% on the second quarter of this year and 20% below the number for Q3 2012, according to the latest data on deals and projects compiled by research company Bloomberg New Energy Finance. The group also noted that additional investments in efficiency could cut U.S. energy consumption by 23 percent by 2020, save customers nearly $700 billion, and create up to 900,000 direct jobs. 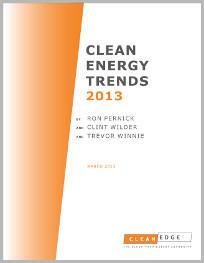 Clean Energy Trends is the signature report of the clean-energy economy. The report also outlines five key trends that will impact clean-energy markets in the coming years. The NASDAQ Clean Edge Green Energy Index rose 75% from January 1, 2013 through November 1, 2013. The NASDAQ Clean Edge Smart Grid Infrastructure Index saw a 19% gain during the same period. Join us on Twitter and LinkedIn. Copyright © 2013 Clean Edge, Inc., All rights reserved.